Experience the splendour of Zimbabwe. You can visit the ancient Ruins of Great Zimbabwe, the beautiful Lake Kariba, take a safari in the pristine wilderness of Hwange National Park and the legendary Victoria Falls. Zimbabwe is a captivating land of teak woodlands, granite outcrops and diverse wildlife and is home to the legendary Victoria Falls. It is a country steeped in human history, telling of the developement and conflict of the human race. From ancient cities to pristine wilderness areas Zimbabwe will capture your soul. Hwange National Park was first founded in 1950 and lies in the far north-west of Zimbabwe. It has one of the largest varieties of animal life to be seen in one area in the world and is one of the finest Elephant conservation areas in Africa. The park is a vast grassland area of shrub and woodland with shallow pans and natural salt licks which attract the wildlife, making it ideal for a game viewing safari. One of the seven natural wonders of the world, Victoria Falls is Africa's adventure capitol. Some of the best views of the Falls are from the Zimbabwean side. Explore the unique rain forest ecosystem created by the spray from the Falls, which boasts rare orchids and pretty pink wild ginger. Thrill seekers can enjoy one of the world's highest bungee jumps from the Victoria Falls Bridge. Or get wet, white water rafting in the gorge. Thrilling flights such as the 'Flight of the Angels', offer fantastic aerial views of the falls. Matobo Hills near Bulawayo is home to the White Rhino, Sable antelope, Leopard and Klipspringer and has greatest concentration of Black Eagles in the world. Bushman rock art dating back several hundred years can be discovered, and some of the finest examples of this ancient rock art are found in the caves of the Matobo Hills. The Park lies on the shore of the Lake Kariba and offers a wide variety of wildlife. 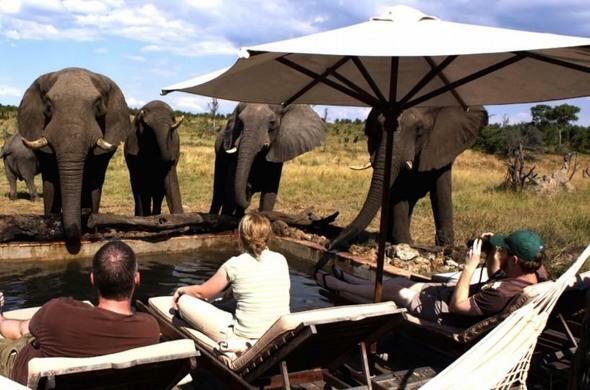 Game viewing safaris by boat, open safari vehicle and on foot are conducted on the the shoreline. There is a small but important population of the endangered Black Rhinoceros, with Lion, Leopard, Hyaena and other predators occurring in good numbers throughout the Park.